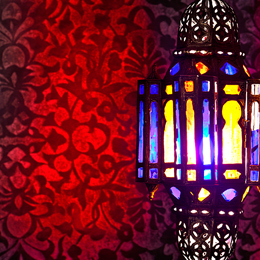 Discover the vibrant atmosphere and dramatic landscapes of Morocco. Feast your eyes upon luxurious Moroccan furnishings in each of your retreats as you explore your surroundings by foot, bicycle or four-wheel drive. From lush oases and exotic cities to traditional villages and ancient kasbahs, immerse yourself in the magic of Morocco. A blend of artisan craftsmen, famous souks and a bustling medina make exploring Marrakech and Fes a delight to the senses. Join the locals as you experience the spectacular and lively Djemaa el-Fna square. In Essaouira, discover the idyllic and heady mix of whitewashed buildings and picture postcard ramparts by the sea. 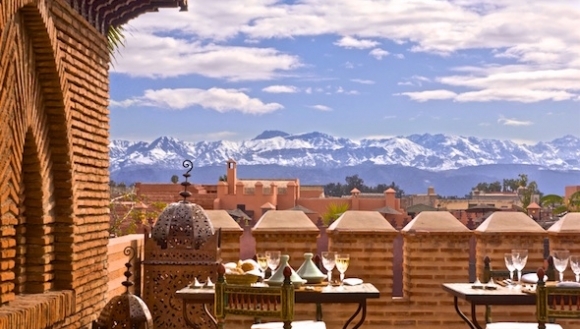 Swap the spectacle of Marrakech for the traditions and beauty of the High Atlas Mountains. 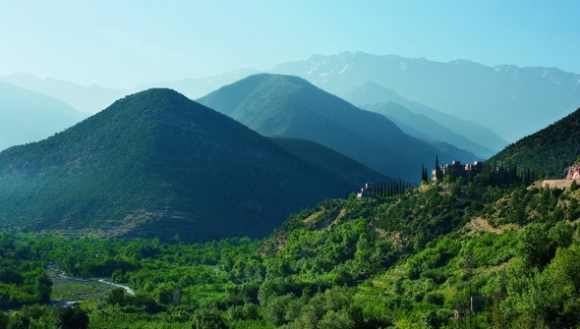 Trek, cycle and four-wheel drive through dramatic landscapes, traditional earthen Berber villages and walnut grove-filled valleys, before retreating to an elegant hideaway. Magical landscapes away from the bustling cities await you. Explore local villages and kasbahs and discover a rich nomadic history and a kaleidoscope of exotic cultures. With the scene set, lose yourself to the heady mix of lush oases, traditional villages and lunar landscapes as you explore on foot and by bicycle, then enjoy the brilliance of the stars at night from your luxury sanctuary, a truly sublime vision. 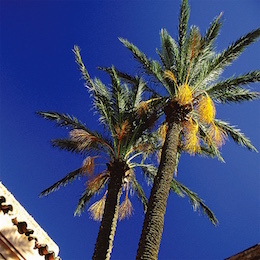 Arrive at Casablanca International Airport and transfer to Fes, where a vibrant and atmospheric spectacle greets you. 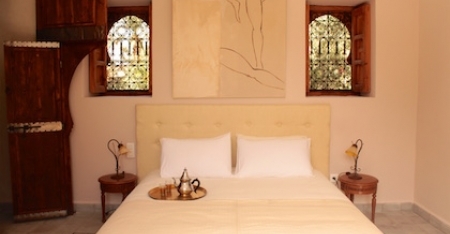 In a small laneway in the heart of the medina, knock on the heavy wooden door to reveal exquisite Riad Fes and your home for the next few nights as you begin your discovery of the world’s largest medina. 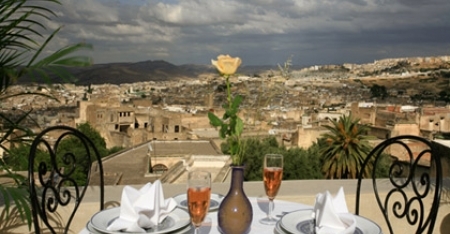 Today you begin to uncover the soul of one of Morocco’s most exotic cities, Fes. In the company of your resident expert, a riot of sights and sounds greet you. Narrow winding lanes, artisan craftsmen, bazaars and workshops are the order of the day. 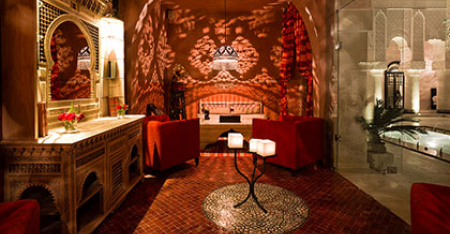 Lose yourself to the heartbeat of the oldest of Morocco’s imperial cities, then retreat to your luxury haven. 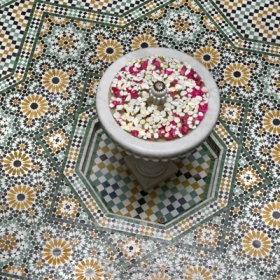 Travel to the imperial city of Meknes, known as the “Moroccan Versailles”. 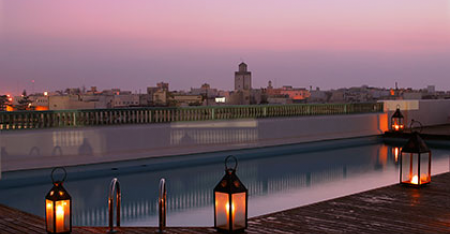 A one-time home of the Moroccan sultanate, lose yourself among winding narrow medina streets and grand buildings. From Meknes we visit the ancient Roman ruins of Volubilis, sprawled across a wildflower-dotted hillside, and the hilltop tomb of My Driss, two of Morocco’s most significant historic sites. 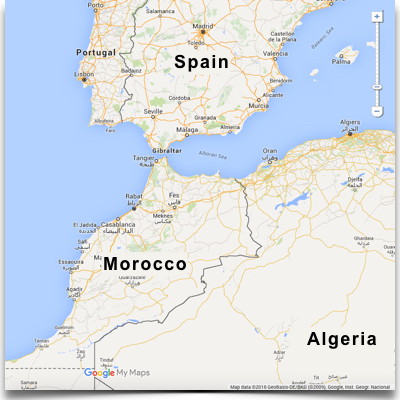 Flying to Zagora you begin your desert adventure. On arrival, visit the Koranic library of Tamagroute and experience a nomad village, then embark on a 4x4 adventure into the Sahara Desert. 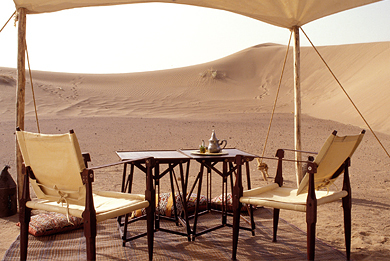 Explore the dunes of Erg Chigaga before arriving at Azalai Desert Camp, your luxury desert home for the night. 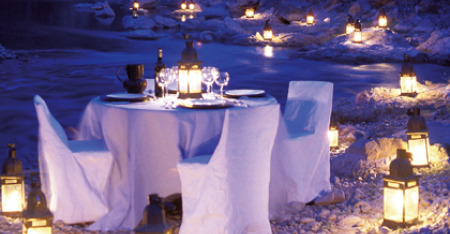 Soak up the desert landscape before enjoying dinner under a sea of stars. Rise early to climb the sand dunes and watch the sunrise over the spectacular desert landscape. Before the sun is too high enjoy a camel safari into the Sahara Desert. 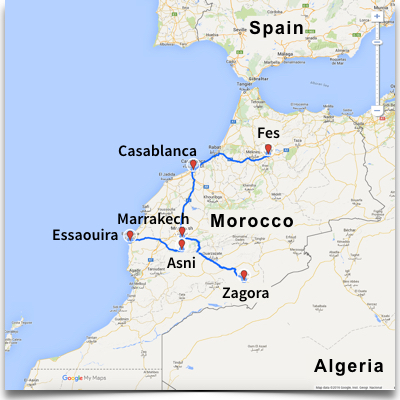 Transferring back to Zagora, soak up the sheer remoteness of Morocco. 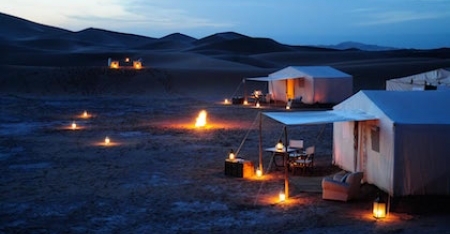 Your oasis for the night on the fringe of the Desert is the luxurious Azalai Desert Lodge. 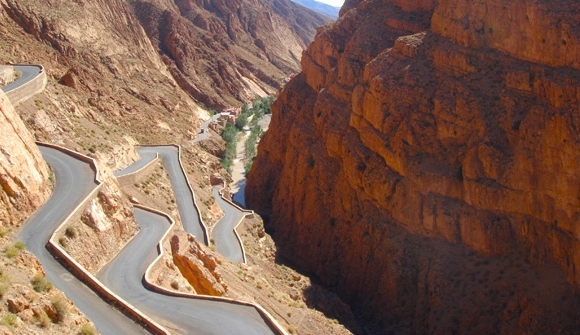 En route to Marrakech today, driving over the highest mountain road in Morocco, the Tizi n’Tichka pass, you will experience stunning earth-red villages, lush valleys and date palm groves. In the evening, immerse yourself in Marrakech’s exotic Djemaa el-Fna square – coming alive at night, you won’t know where to look next. Today, Marrakech awaits. Ignite your senses with its exotic blend of artisan craftsmen, famous souks and glorious palaces as we explore this captivating city on foot. After a day of exploring, retreat to the sanctuary of your riad, indulge in a traditional hammam spa and enjoy dinner alfresco in the villa courtyard of one of our favourite Marrakech restaurants. Today you make your way to the High Atlas Mountains to begin your discovery of this area on bicycle and foot. 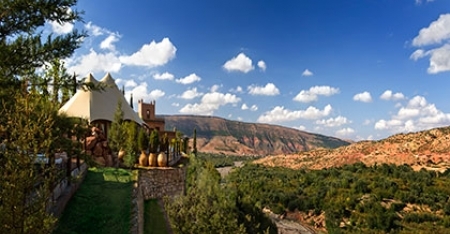 The highest mountain range in North Africa, climb ever upwards until you reach your base for the next three nights, Kasbah Tamadot. 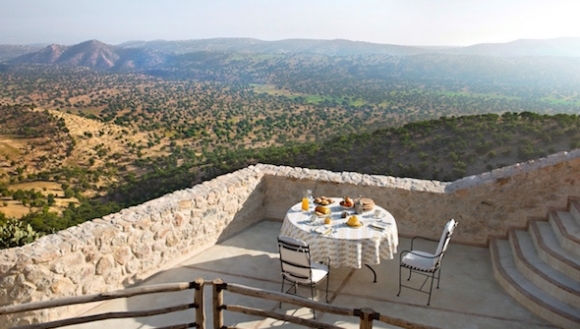 One of Morocco’s most exclusive retreats, enjoy the stunning valley views before dinner on the outdoor terrace. Trekking through the Toubkal National Park, soak up the views of traditional earthen Berber villages and walnut grove-filled valleys. 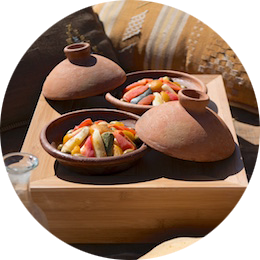 After a few hours, you reach a small village at the foothills of the mountains and enjoy a tagine picnic lunch. Returning to your retreat, you’ll have time to rest your legs and indulge in a relaxing massage. Leaving the mountains you head for charming UNESCO World Heritage listed Essaouira. Stopping at a local fromagerie you linger over a lunch of local produce and wine. 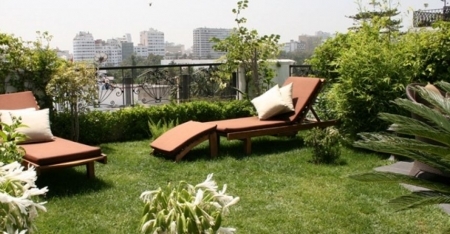 An idyllic mix of photogenic ramparts, white-washed buildings and azure shutters greets you. Enjoy dinner tonight overlooking the Atlantic Ocean at one of our favourite seafood restaurants. Wake up in your stylish suite at intimate Heure Bleue and enjoy breakfast with views of the bustling port below. Today you discover Essaouira on foot with a resident expert. Lose yourself to its charming mix of winding lanes, artisan craftsmen and Atlantic Ocean views and soak up the relaxed atmosphere. 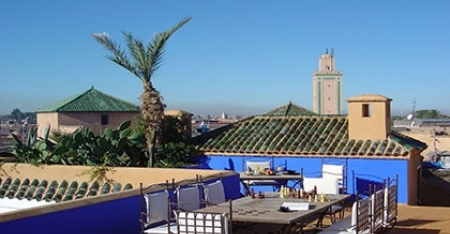 From the roof-top lounge of Heure Bleue, enjoy the sea breeze and bustle of seaside life below before transferring back to Casablanca for your departure flight. 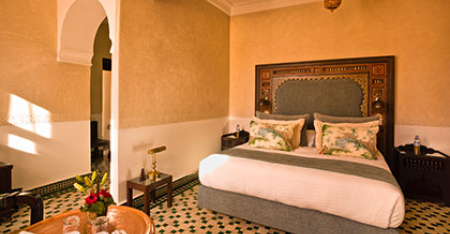 In the heart of Fes and surrounded by artisan craftsmen, soak up the atmosphere of the world’s largest medina then relax at Riad Fes. Sleek woods, rich carpets, lush gardens and ornately tiled courtyards make this indulgent and intimate hotel the perfect haven. 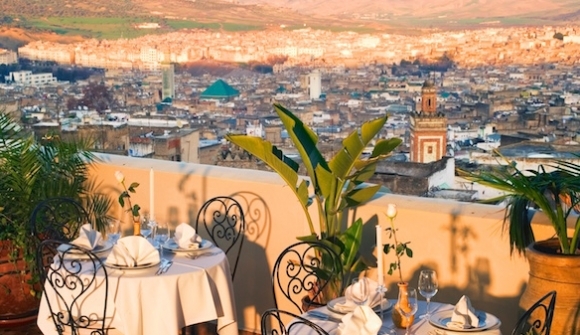 Each evening, enjoy cocktails on the terrace in the company of stunning medina views framed by the burnt orange hues of the Atlas Mountains. 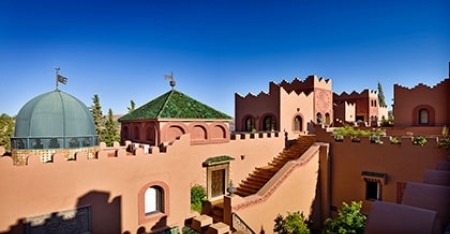 The first Relais & Chateaux property in Morocco, enjoy drinks on the roo!op overlooking Casablanca followed by dinner in the elegant dining room. 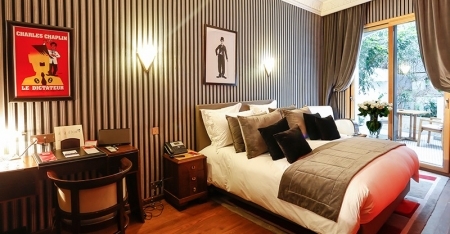 At night rest and relax in elegant rooms. With each room designed a!er a famous author or artist, and furnished with unique art and decor, enjoy the warm and personalised service on offer here. 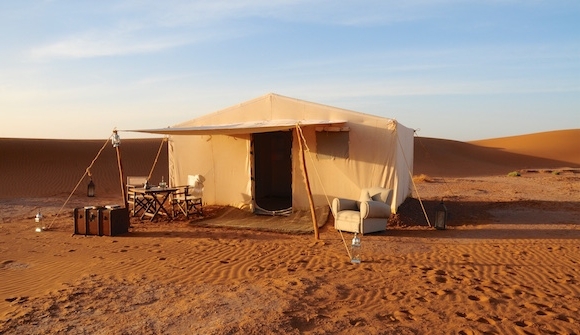 Arrive by four wheel drive, walk over the dunes of the Sahara Desert, be greeted with fresh dates and mint tea, and soak up the vista of this luxury desert camp situated in its own private encampment. Enjoy spacious canvas tents furnished with a queen-size poster bed dressed in fine cotton linens, bedside tables, rattan flooring and night lanterns. 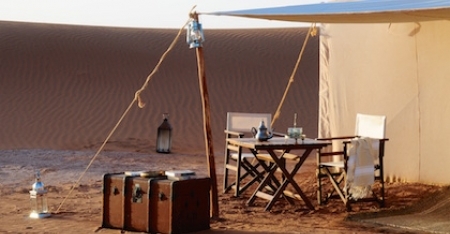 The ultimate luxury desert camp experience. 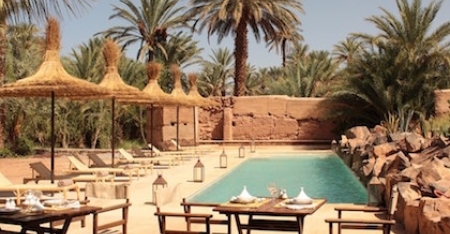 At the edge of the Sahara, and hidden within the Draa Valley oasis, the Azalai Desert Lodge is a luxurious Moroccan-owned retreat with secluded gardens, creative cuisine, and a stunning interior. With a French artist enlisted to create a romantic space inspired by famous authors, artists, and travellers of the 20th century, enjoy the impeccably finished rooms and gardens planted with olive trees, palms, and hibiscus. 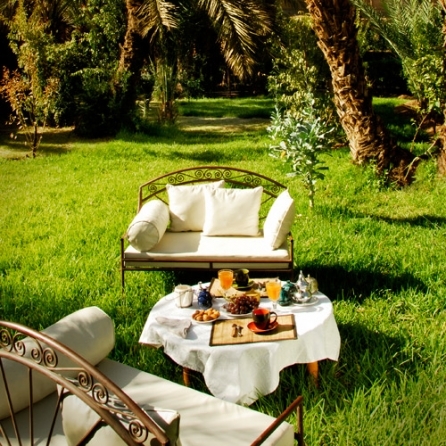 Ignite your senses each day in vibrant Marrakech, then retreat to the sanctuary of Riad Farnatchi. 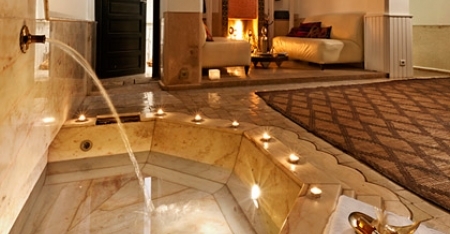 Located in the heart of the medina, after a day of exploring relax in the traditional white marble hammam or take a swim in the refreshing courtyard pool. 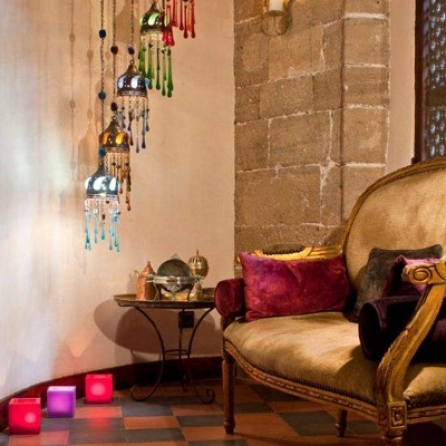 Enjoy the exceptional food, warm Moroccan service and the exquisitely decorated suites, terraces and library rooms. At the edge of the Sahara and in the heart of a palm grove, the 19th century kasbah Dar Ahlam makes for a memorable experience during your stay in Skoura. A Relais & Châteaux hotel, enjoy the labyrinth of gardens, sparkling pool and stylish blend of modern and traditional Moroccan design. 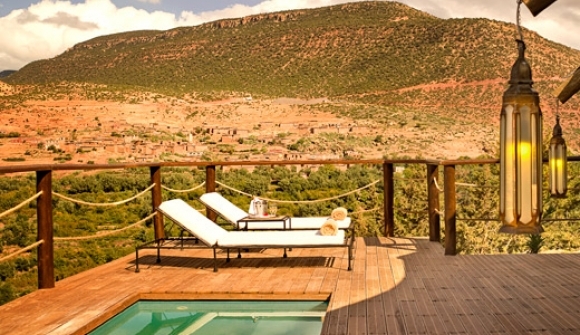 Meaning ‘House of Dreams’, this is one of Morocco’s most memorable retreats. 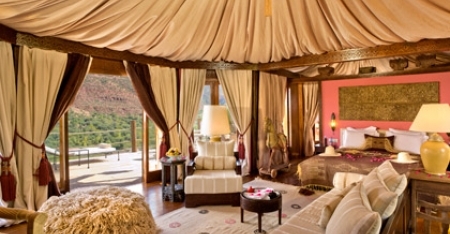 In the High Atlas Mountains you stay at Kasbah Tamadot. A beautiful walled retreat, enter through the wooden doors to reveal peaceful courtyards and fragrant gardens then enjoy the views of snow-capped mountains and lush valleys. 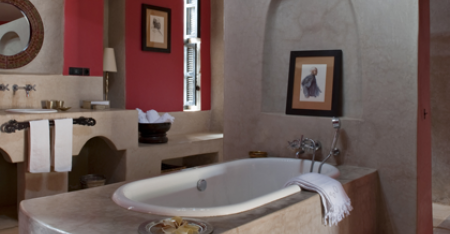 Trekking and cycling during the day, indulge at night in your suite with its rich Moroccan furnishings, antique artefacts and claw foot bathtub. 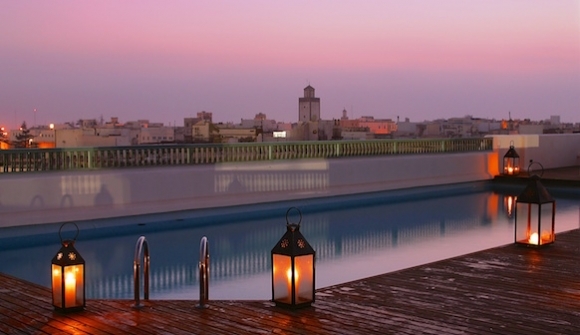 During your discovery of Essaouira, you stay at Heure Bleue. 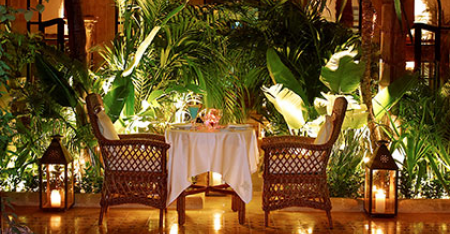 With a hint of Raffles and a dash of caravanserai, this intimate hotel is perfectly located. From the roof-top lounge enjoy the sea breeze and bustle of seaside life below. 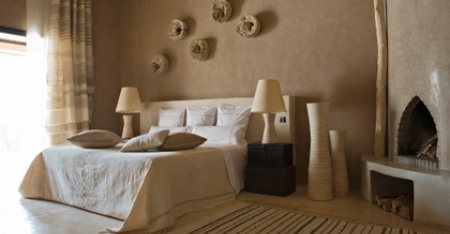 A mix of colonial and modern design, the suites are an exquisite blend of handmade fabrics and vintage furnishings. Small villages, a rich nomadic history and a kaleidoscope of cultures sets the perfect scene. Trekking through the Atlas Mountains, soak up views of traditional Berber villages and walnut grove-filled valleys before returning to your tranquil retreat.